It's been so long that I can't remember when, after a major event like the Benghazi murders on 9/11/12, that it wasn't reported that BO immediately went off to a campaign fundraiser. I think we heard this so often, & still do, that we just didn't think about what this meant – it was like water running off a ducks back or just noise we heard with no meaning. The graphic below explains that BO is determined to not let the midterm elections in his sixth year in office be the agenda breaker that it traditionally has been for his predecessors – & having money to tell a misleading story is @ the heart of his plan. We have learned what it means to be a community organizer. With regard to the midterm elections pundits like Karl Rove have opined that Republicans are in a very strong position to win control of the Senate while taking for granted that they will hold, if not increase, their House majority – both of these potential accomplishments are important because they will help rein in the last two years of BO's intentionally destructive agenda & give the country a small chance to avoid becoming a politically ruined nation after the 2016 presidential election. 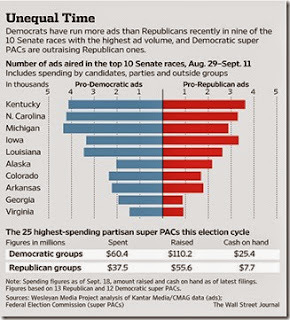 But to counter the theoretical Republican strong position the above graphic shows that Democrats have received far more campaign donations & it has come to light that many of the Senate races are much closer than thought – possibly because of the money spent. Couple this with the natural Democrat advantage of promoting welfare dependent programs that in reality perpetuate the deterioration of the American standard of living – like the spreading national trend of raising the minimum wage laws – & you can see a Republican victory is far from assured. Comprehensive immigration reform is always on the Democrat front burner (although sometimes on simmer like now) & this promise of amnesty will ensure the Hispanic vote for Democrats while the claims of the Republicans' "war on women" will attract the usual women voters to Democrat candidates. MO, with an approval rating of well over 60%, has recently pushed women's issues & this should continue. The money advantage allows Democrats to present negative ads that trash Republicans & this might just work in enough races for Democrats to hold control of the Senate what with Republicans already excruciatingly low approval ratings. The Democrat Senatorial Committee plans to spend $23 million in TV advertising in Iowa, North Carolina, & Colorado which is $4 million more than Republicans plan to spend in the entire country. Source WSJ. Republicans are being outspent in nine of the ten competitive races shown in the above graphic – all except Alaska. Who can blame Republican donors after the last two miserable candidates the GOP put up for president. For those who still do not think there is more than a dime's worth of difference between such Republicans & their statist opponents please consider the example that Gina McCarthy, BO's recently appointed & confirmed head of the EPA, was an environmental adviser to Mitt Romney in Massachusetts before BO picked her for her current spot. Oh please. Long gone is the Republican single minded strategy of running only against ObamaCare which is starting to become more accepted & popular with an unsuspecting populace. Of course a major part of this is because BO unilaterally delayed the most onerous parts of his law – for instance the next open enrollment on the healthcare exchanges starts on November 15, eleven days after the midterm elections. How convenient since premiums are expected to go up an average of 10% for coverage in 2015. In addition, the changes to ObamaCare continue to phase in. The first set of penalties for not having healthcare insurance start this year - but are not payable until April 15, 2015. This leaves Republicans telling disinterested people how bad their healthcare future will be but with no concrete proof until after the election – not a political winner on November 4. Just like Medicare, a tremendous loser for taxpayers, ObamaCare's burden on the country will increase in 2015. According to an HHS summary through mid-August the number of insurance companies offering ObamaCare healthcare insurance plans will expand in 2015 from 252 to 316 – 77 new insurers with only 13 dropping out of the healthcare insurance exchanges. The summary does not include seven states & the new plans are still subject to approval but you can get the idea that insurance companies want in. In summary insurance companies want in, people will not know the detrimental effects of ObamaCare until after the midterms, & Republicans are left either dropping the issue or telling people how bad it is when hardly anyone has experienced the coming negatives themselves. We have an idea what Republicans are against but don't know what they are definitely for other than picking up control of the Senate. We also know House Republicans have a modest goal of picking up 12 seats – a very small target in such an anemic economy where the latest Pew Research poll found only 21% think the recession that officially ended in June 2009 is over. With a median annual household income of about $50,000 & the Federal Reserve's target inflation rate of 2% people @ the median will lose $1,000 per year in purchasing power in accordance with the policy of the government agency that was established to maintain the purchasing power of the dollar. But the meager 12 House seat pick-up goal is the reality for a country in the apathy to dependence stage – another sign of Death Of Democracy of the American Republic. A significant percentage of the country is just not interested in anything but electing statists who support & provide government dependent programs – this is what must be turned around in order for the country to prosper so that everyone not only knows the recession has ended but can participate in the prosperity to the best of their ability. So what happens if Republicans win the Senate & hold the House. To paraphrase Pelosi "you'll have to elect the Republicans to find out what their plans & programs are." We all can list the libertarian & Tea Party points of limited government, personnel responsibility, & free enterprise that candidates worth voting for follow as a matter of routine. But if this was the norm members of Congress would not need to be off for six weeks prior to an election campaigning day & night telling us with carefully orchestrated positions based on political calculations to win over one group or another how they have our interest @ heart – when we know that the overwhelming majority have only their own interest @ heart. Many in this readership have already stopped voting for the Republican lesser of two evils (Republican or Democrat) because it is this two-party philosophy that brought us to this stage in our descent toward dependency & less self-sufficiency. The stakes are high in this election & the 2016 presidential election but even higher is stopping the drift away from our founding principles – this drift cannot end well & the sooner we start to turn it around the better. With the awareness of the millennial generation (ages 18 to 34) coupled with negative electoral experiences of the baby boomers more & more people realize they are not voting for choices because there is just one Big Government Party (think – you wind up with both government run healthcare & Gina McCarthy as head of the EPA with either BO or Romney as president) where the elites in the Democrat & Republican wings of this party take turns being in power. How ironic that a people who have become so dependent on government would now think they have the power, let alone ability, to properly elect their representatives in government. I have advocated for years that we need more than two major parties (currently two wings of one Big Government Party). To me you can't have enough parties & if you have more than two viable parties many presidential elections will be decided in the House of Representatives (who vote for the three candidates who received the most electoral votes) per the Constitution when no one candidate receives a majority of electoral votes (currently 270). A much better system than two parties taking turns being in power. You can't start sooner than this election to break the two party cycle that produces congresses with under 20% approval ratings but 90% incumbent reelection rates. Do you want to waste your vote? Gary Johnson answered the wasted vote question in a Third Party presidential debate two years ago - "Wasted Vote? The only wasted vote is when you vote for someone you don't truly believe in." Let left-wing statists vote for Democrats who support forcing taxpayers to pay for big government social programs & right-wing conservatives vote for Republicans who support laws that restrict personal behavior that violates their ideas of traditional values. If the rest of the people vote for candidates who are financially responsible & socially tolerant we will have established a viable third choice which is the last thing the two major parties want. Since the last election RTE has posted the voting records of both House & Senate members on many important issues as well as highlighting some excellent candidates. These people are far superior to McCain, Romney, Boehner, McConnell, Leonard Lance, Rodney Frelinghuysen, or any Democrat – all on this list except the Democrats pander for votes in a way that is not believable to Hispanics, Asians, blacks, homosexuals, single women, young people, & the poor. It is this type of information & knowledge that is essential for us to remain free – I do this for my personal benefit in formulating my own opinions & the blog is a way of sharing my work. You have five weeks to find candidates worth voting for – make the most of it.